Mushrooms contain some of the most powerful natural medicines on the planet, especially for boosting your immunity during cold and flu season. 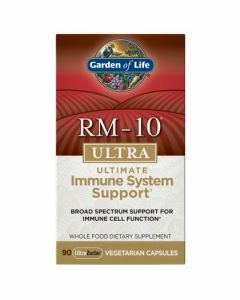 If you want one immune booster to add to your arsenal this flu this season, Garden of Life’s RM10 and RM10 Ultra are supplements you need to know about. For centuries, medicinal mushrooms like Reishi and Cordyceps have been used in Chinese medicine. Only recently has research into the effects of mushrooms on the immune system put medicinal mushrooms into the spotlight. RM-10 is a combination of 10 tonic mushrooms that have been specially selected for their superior genetic heritage and then carefully cultivated to ensure they maintain their integrity and potency. This blend is synergistically balanced with Cat’s Claw (an anti-inflammatory) and Poten-Zyme Selenium, a highly absorbable form of selenium. Selenium supports immune cell function and response. For therapeutic purposes it’s best to combine several mushroom species. Stubborn pathogens in your body can build up a resistance to one mushroom alone but unlikely to do so with a variety of several species. Secondly, each mushroom species has a unique arsenal of anti-infective and immune enhancing properties. Lastly, each mushroom also addresses unique forms of exhaustion and low energy. RM-10’s combination of 10 organically grown, tonic mushrooms have been specially selected for their superior genetic heritage and then carefully cultivated to ensure they maintain their integrity and potency. Shitake: helps body tissues to absorb cholesterol and lower the amount circulating in the blood. Shitakes also have antiviral and anticancer effects. Maitake: has anticancer, antiviral, and immune-system enhancing effects. Also helps control both high blood pressure and blood sugar levels. Lion’s Mane: displays nerve-regenerative properties. They also significantly improve brain function and memory. Turkey Tail: capable of stimulating the immune system. 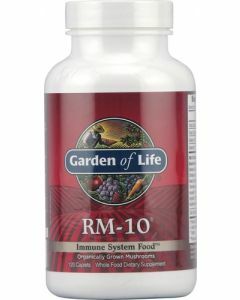 RM-10 is a 100% Vegetarian Product from Garden of Life.